This Situation Update describes events occurring in Bu Tho and Dwe Lo townships, Hpapun District from November 2013 to January 2014, including violent abuse, forced labour, corruption by Burma/Myanmar government personnel, and large-scale development projects. On November 10th 2013, four soldiers from Tatmadaw Light Infantry Battalion (LIB) #341 attempted to desert with the help of Maung A---, a motorbike taxi driver. When Maung A--- threatened to report them to the LIB #341’s battalion commander, one of the soldiers stabbed him with a knife. 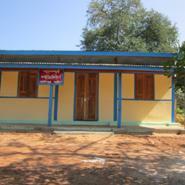 Village administrator U Mya Kyaing demanded that villagers from B--- village build a library. Fifteen people per day, including men, women and children, had to complete all of the work necessary for the library to be built. U Poe Sein Gyi, the secretary administrator of Hpapun Township’s Irrigation Canal and Agricultural Department, budgeted 6,000,000 kyat (US $5,802.71) for an irrigation repair project but spent only 1,000,000 kyat (US $967.12) on an incomplete repair and embezzled the remaining funds. 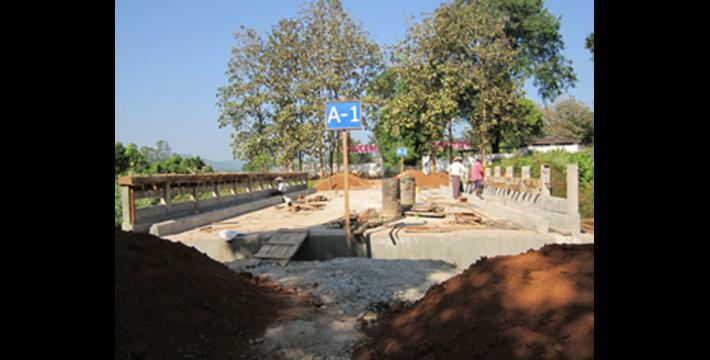 Burma/Myanmar government Special Construction Group #13 constructed five bridges in Hpapun Town, while the Hpapun - Ka Ma Maung road has also been repaired. The following Situation Update was received by KHRG in July 2014. It was written by a community member in Hpapun District who has been trained by KHRG to monitor local human rights conditions. It is presented below translated exactly as originally written, save for minor edits for clarity and security. This report was received along with other information from Hpapun District, including one other situation update, eight incident reports, 45 interviews, and 711 photographs. The social issues that I am going to mention right now include not only human rights abuses but also cultural issues, regional development issues, business issues, and criminal cases. These events generally occurred between November 2013 and January 2014, with different events happening on different dates and in different places. The embezzlement of citizens’ money by the [Hpapun Township] Irrigation Canal [and Agricultural] Department on November 11th 2013 [occurred] in Hway Hsan village, Meh Ka Law village tract, Bu Tho Township. On November 10th 2013, the soldier Kyaw Kyaw Tun, along with a group of soldiers from LIB [Light Infantry Battalion] #341, stabbed Maung A--- with a knife [in an attempt to kill him]. Fortunately, Maung A--- did not die. This is [what I categorise as a] ‘stabbing case’. On the same day, November 10th 2013, in B--- village, ten house leader U Mya Kyaing forcibly asked B--- villagers to build a library named P’Nya Tan Kun [The Power of Education]. This is the [case of] forced labour. [All of] these events occurred in different places and at different times. Development projects that benefit civilians, including: constructing bridges, building a school, building a road, and the business of breaking and selling stone to build a road (stone mining). [In order] to discuss [each issue] thoroughly, I first want to explain the stabbing case that I saw when I was on my way back home. The stabbing case that I mentioned above happened because soldiers from LIB #341 in and around B--- village were being unruly. It [the stabbing] occurred on the Hpapun Town to Ka Ma Maung road (Aung Thein Di road) at a place near D--- village, eight miles away from Hpapun Town, on November 10th 2013. According to the KNU controlled area [place names], it happened near E--- village, Meh Klaw village tract, Bu Tho Township, Hpapun District. The stabbing happened because of the foolishness of the soldiers Kyaw Kyaw Tun, Myat Soe, Ye Lin Oo and an unknown soldier from LIB #341. They were planning to desert from their battalion. In this stabbing case, the person who was stabbed was Maung A---, a 26-year-old who is a Muslim. The soldier Kyaw Kyaw Tun from LIB #341 stabbed Maung A--- with a knife. The stabbing case happened in this way on November 10th 2013. Since the four soldiers from LIB #341, including Kyaw Kyaw Tun, wanted to desert from their battalion, they covertly rented motorbikes from Maung A--- [a motorbike taxi driver] and drove away [with him] on his two motorbikes from their battalion on the Hpapun to Ka Ma Maung road. When they, five people total with two motorbikes, arrived at E--- village, eight miles away from Hpapun Town, the taxi driver Maung A--- said to them that he did not want to continue taking them. He [said] that he would report to LIB #341’s commander if the four soldiers were going to desert from the battalion. Among the soldiers, soldier Kyaw Kyaw Tun was worried that they would not escape if they deserted, so he stabbed Maung A--- with a knife that he had brought with him. Although Maung A--- was stabbed with a knife by the soldier Kyaw Kyaw Tun [in an attempt to] kill him so that he would be silent, he did not die. He ran away to E--- village, which is close to the place where the incident happened, to escape. The villagers [there] sent him to the Hpapun Township civilian hospital. Kyaw Kyaw Tun and his friends were arrested by Tatmadaw soldiers in Yay Pu Sit army camp when they [Kyaw Kyaw Tun and the others] had almost reached Hpapun Town. They were sent back to LIB #341. The battalion commander, Lieutenant Colonel Thet Naing Win, did not bother [or punish] Maung A--- [for helping the soldiers]. He also did not punish the soldiers except by putting the soldiers into custody for three days after the case happened. Now the wound of Maung A---’s stomach, which required six stitches, has recovered. On the same day that the incident [stabbing] occurred, November 10th 2013, an incident of forced labour began in B--- village, Hpapun Town (B--- village, Meh Ka Law village tract, Bu Tho Township, Mu Traw (Hpapun) District). It [the case of forced labour] lasted 20 days. The human rights abuse [incident] of forced labour started in B--- village, Meh Ka Law village tract, Bu Tho Township on November 10th 2013. The person who committed the forced labour [infraction] is U Mya Kyaing, the ten house leader and a member of B--- village administration. The people who were forced [into] labour were the B--- villagers. The work that U Mya Kyaing forcibly asked the villagers to do was to build a library named P’Nya Ta Kun [The Power of Education] at the entrance of B--- village. A Hpapun District level department gave 3,000,000 kyat (US $2,901.35) to B--- village head U Aung Shwe to build a library for the development of the village. Since U Aung Shwe lives in Hway Mon village, U Mya Kyaing [who lives in B--- village] had to purchase [building supplies] and organise [resources] in order to have enough bricks, cement, and sand necessary for building a library. He also hired a carpenter to build the library for hundreds of thousands of kyat. As the library was meant to be 300 square feet, it was impossible to build it with only one carpenter. Therefore, U Mya Kyaing demanded labourers and villagers to build the library. [Each] day a total of 15 people, including men, women and children, had to carry sand and bricks, mix the cement and [complete] all of the hard work [that was] necessary. The villagers were not paid any compensation and each day 15 villagers had to work [as part of a] rotation. All of the villagers had to work until the building of the library was finished. Ten house leader U Mya Kyaing employed a total of 225 villagers for labour over 15 days. Although B--- villagers did not want to do forced labour, they could not find any civilian representative who they could depend on or a [Burma/Myanmar] government or organisation [representative] who could represent the civilians and report about [the abuse]. Since [there was no one] they could discuss with, they could not defend [against] the words that U Mya Kyaing’s threatened them with: “If you do not do forced labour, I am going to report to the top leader, the civilian police or put you into custody.” Therefore, they had to labour unwillingly. 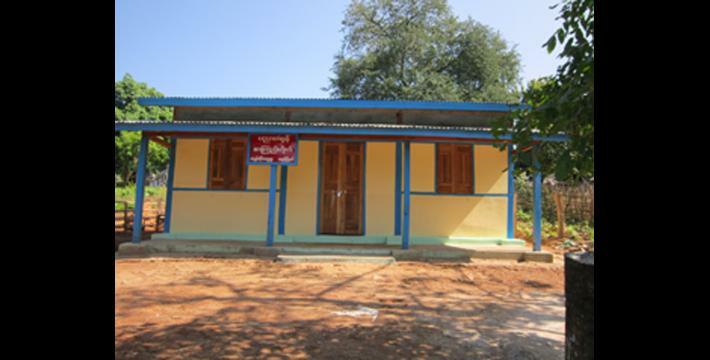 Now, P’Nya Ta Kun library has been built in B--- village. The library was completed on November 30th 2013. In addition to the incident of forced labour, I am also going to discuss the issue of cash embezzlement, money lending and the corruption of public funds by the Naypyidaw government staff. The embezzlement of civilians’ money that I am going to mention now happened in Hway Hsan village, Meh Ka Law village tract, Bu Tho Township, Mu Traw [Hpapun] District on October 12th 2013. The reason why the incident happened is because the water barricade of the big water channel, which is [part of the irrigation system that] distributes water to the paddy fields near Hway Hsan village, was almost destroyed due to water erosion [and therefore needed repairing]. The perpetrator of this violation is U Poe Sein Gyi, the secretary administrator of Hpapun Township’s Irrigation Canal and Agricultural Department. The victims are the villagers, especially the farmers from Hway Hsan village. On November 1st 2013, the Irrigation Canal [and Agricultural] Department budgeted 6,000,000 kyat (US $5,802.71) for the cost of the development [project] to repair the water irrigation [system] in order for the Hway Hsan farmers to get enough water to their paddy fields. Therefore, U Poe Sein Gyi, the secretary administrator of Hpapun Township’s Irrigation Canal and Agricultural Department, and a group of his people arrived at Hway Hsan village on November 12th 2013 and surveyed the water irrigation [system] that had been destroyed. They then made plans to repair it. In actuality, the length of the water irrigation [system] which has been destroyed is 130 feet but they are only repairing 35 feet [of the system]. In terms of repairing the 35 foot length of the water barricade, they are not going to repair it with concrete; [instead], it is [being] repaired with bags of sand. So it is likely that it is going to be destroyed again soon. 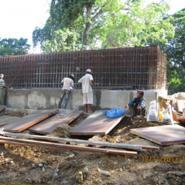 It will cost about 1,000,000 kyat (US $967.12) if 35 feet [are repaired to a height of] 10 feet with [the use of] sand bags. Since it was planned [budgeted] at 6,000,000 kyat for all the expenditures, there is a large difference [between cost and budget]. Therefore, the money of citizens is being stolen by the Irrigation Canal and Agricultural Department [as] excess [funds designated for] repairing the water irrigation project. There are some human rights abuses occurring [in Hpapun District], as has been shown above. 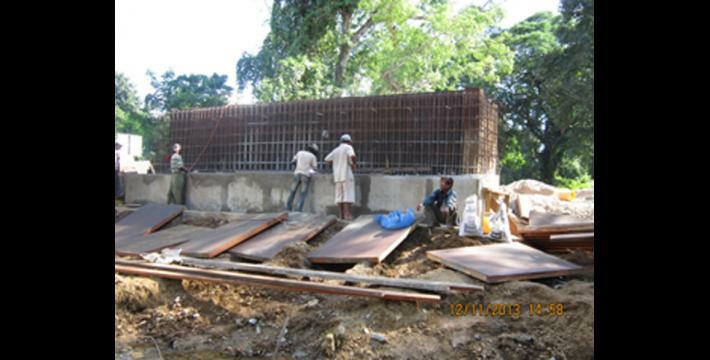 [As well], there are some development project which benefit civilians. They [the development projects benefiting civilians] include the building of the Hpapun to Ka Ma Maung road, repairing this road, and the business of grinding and breaking stone, including the mining of stone [from the] mountain with dynamite to produce gravel for building the road. With regards to the [development projects], I firstly want to talk about bridge construction. In terms of constructing bridges, in the beginning of 2013, [the Burma/Myanmar government’s] Special Construction Group #13 constructed Section #2 Bridge (also known as Bay Li Bridge or Wun S’Lay River Bridge), Ta Kun Taing Bridge, Hway Hsan Bridge, and Nyi Naung river Bridge [all] in Hpapun Town. If [one] started from the bridge that is near the entrance of LIB #434’s base (between Ta Kun Taing village and LIB#434) and went towards Ka Ma Maung [Town], there is another bridge at the place where the Special Construction Group #13 lives. From there to the south, there is Nyi Naung Bridge which is north of Ma Htaw village. 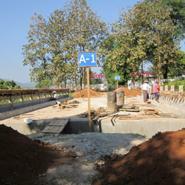 There is [also] Ma Htaw village Bridge at the entrance [of Ma Htaw village] which is to the south of Nyi Naung Bridge. There is also lower Ma Htaw villages’ bridge. Construction began on the five bridges on November 12th 2013 and [was] led by Hpapun Township Construction Engineer Daw Aye Maw. Since the Hpapun to Ka Ma Maung road is repaired and built [up] every year, most of the roads [in Hpapun Town] are almost done. [However], the ten mile long road which is between Ma Htaw village and Twenty Mile village has not been built yet. [Therefore], the Hpapun Township Construction Group took responsibility for three miles, the Special Construction Department #9 took responsibility for four miles and the Shin Than Thitsa company took responsibility for three miles and [began] constructing this road. 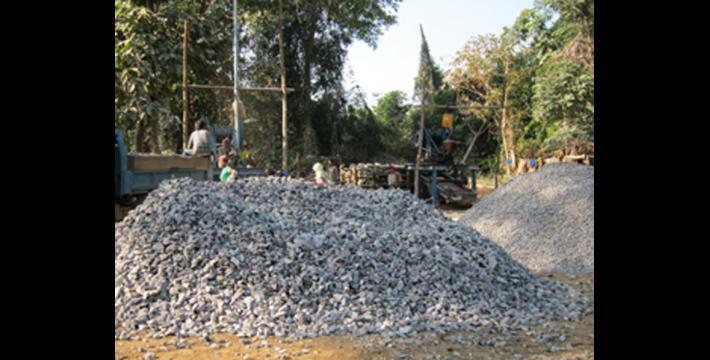 In terms of the stone production [mining] business for road construction, the stone [breaking] machines were set up near Aung Thein Di road, five furlongs (1 km or 0.625 miles) away from the southern part of Ma Htaw village. It [the stone production business] started operating on November 15th 2013. Ma Htaw village is in Ma Htaw village tract, Dwe Lo Township, Mu Traw [Hpapun] District. The person in charge of this project is U Hein Hla Mo. They started to operate with 20,000,000 kyat (US $19,342.36) of capital. 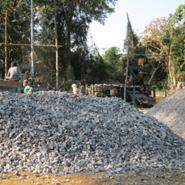 They use eight motor cars for carrying the gravel and they also use a stone [breaking] machine [to break the stones]. They take the necessary stone from the rock mountain range called Tho Po Lay to the southwest of Ma Htaw village by mining with dynamite. The stone [breaking] machine owner, U Hein Hla Mo, sold many different types of stones for road construction to the Shin Than Thitsa company and the [Burma/Myanmar government] Road Construction Department. The average price for a pile of stone (which is ten feet wide in diameter and one foot high) recognized by the [Burma/Myanmar] government is 40,000 kyat (US $38.68). The stone [breaking] machine owner U Hein Hla Mo pays [a wage of] about 15,000 kyat (US $14.51) per pile of stone from the stone breakers [he hires]. The main person who buys the stones from the stone production contractor U Hein Hla Mo is Saw Dee Bay (also known as Saw David). In addition to these development projects, the traditional festivals related to each ethnic [group] have also been celebrated. The [Shan New Year] festival is rarely seen celebrated in Karen [Kayin] State [by Karen people]. That festival is Shan New Year for Shan ethnic people who are living together with Karen people in Karen State. Shan New Year was celebrated by Shan ethnic people on December 3rd 2013. Shan New Year was celebrated on December 3rd 2013. It was celebrated in Nga Ein Su (Nar Ku Nar) village, Meh Ka Law village tract, Bu Tho Township, Mu Traw [Hpapun] District. The people who arranged this celebration were U Win Aung (Shan literature and cultural group organiser from Nga Ein Su village), Nga Ein Su village head U Aung Myint and me, U G---. The money [needed] for the celebration was 600,000 kyat (US $580.27). Later, since some other Shan ethnic people came to know [about the festival celebration], they helped us [donated money] and we finally raised the money: 1,200,000 kyat (US $1,160.54). This [allowed us to] successfully celebrate Shan New Year. There were almost 3,000 people, including Hpapun Township Administrator U Mya Htut Win’s group, attending the Shan New Year celebration. This is the most crowded celebration that has occurred in a Naypyidaw government controlled area (Hpapun Town) since the ceasefire. In conclusion, I can say that there is more freedom [and a better] livelihood situation in the area [Hpapun District]. However, I do not say that there are no more human rights [abuses], as I have mentioned [them] in past reports. They [human right abuse] could happen at any time. Only the type of human right abuse will happen in different ways. [Overall], abuses could be happening more or less. The ten house leader is responsible for the administration of ten households within a given community or village, and answers directly to the village leader. Demands for things such as forced labor would pass from the village head to the ten house leader, who would then have to provide however many villagers were needed per ten households. Villages are also broken down by the 100’s and administered by 100 house leaders when applicable. All conversion estimates for the kyat in this report are based on the March 23rd 2015 official market rate of 1034 kyat to the US $1. A furlong is a unit of distance equivalent to 0.2 of a km. or 0.125 of a mile.